Katie Rausch | The Toledo Blade Toledo's Austen Brassard (5) and Dylan Sadowy (15) can't get control of the puck from Fort Wayne's Mason Baptista (9) as he kicks it out to teammate Curtis Leonard (10) in the third period Saturday at the Huntington Center in Toledo. The Komets beat the Toledo Walleye 5-3. 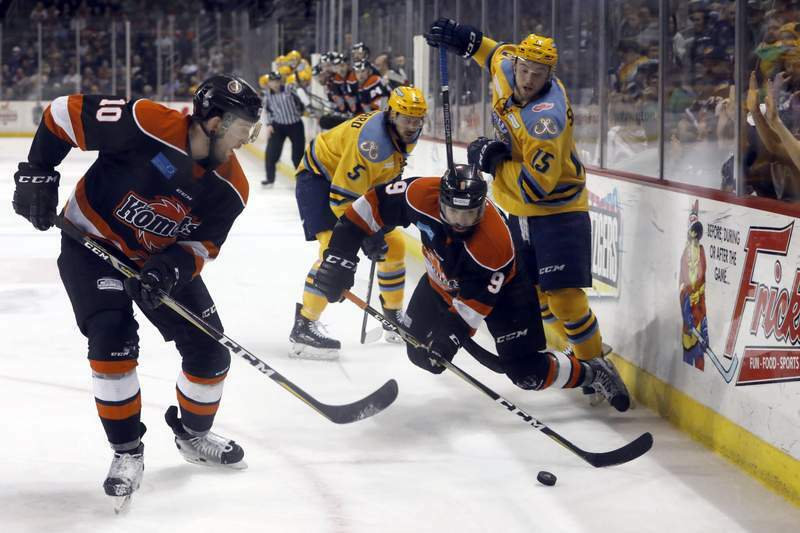 TOLEDO – Lots to unpack from the Komets’ 5-3 series-opening victory over the Toledo Walleye. First, let’s talk about Dennis Kravchenko, who had the winning goal and the insurance goal. He was due. But the feeling in the locker room was he had been doing all the little things. There was definitely a bolt of energy for the Komets with the returns of Ryan Culkin, Marco Roy and particularly Daniel Maggio. The shot-blocking was incredible. Cody Sol had the best one, sliding to interrupt a 2-on-1 rush. “Guys are buying into what (coaches Gary Graham and Ben Boudreau) are putting down into the game plan. You can see it in the locker room. Everyone is buying in. It’s contagious right now,” Sol said. The Komets sure know how to play Pat Nagle, eh? They were shooting high, and he was giving up a lot of rebounds. They must, however, figure out a way to keep A.J. Jenks away from Michael Houser. If I know Toledo, and I think I do, all bets are off now and the Walleye is going to be crashing the crease and the Komets will have to be ready for that. Great offensive showing for the Komets considering how quiet Artur Tyanulin and Phelix Martineau were. But if Shawn Szydlowski didn’t answer the call when the Komets were down two goals, this would have been a different story. That’s what MVPs do though, right?